Adults 4-10 in. 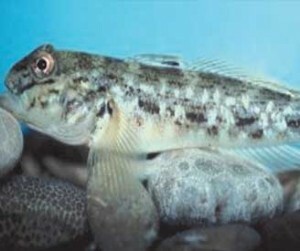 ; gray-green and brown markings; greenish dorsal fin lacks spines; black spot on front dorsal fin. From Black and Caspian Seas. Prefer rock, sand, gravel, and hide in crevices; can tolerate wide temperature and oxygen ranges; can live in slightly brackish or low quality water; nocturnal feeders. Not known to exist in Nebraska. Found primarily in the Great Lakes and its tributaries. Outcompete native fishes for food, prey on darters, sculpin, eggs/fry of lake trout and sturgeon. 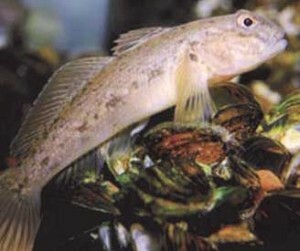 Aggressive behavior drives fish from spawning areas.